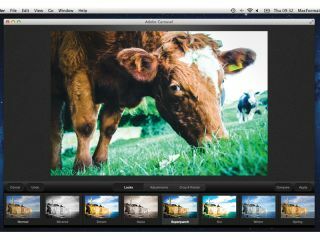 Adobe has renamed its Carousel service, which enables photographs to be accessed across a variety of OS X and iOS devices, to "Adobe Revel". The company, writing on its Photoshop blog, says that while the original name was chosen to reflect the key functionality of the product, ie the ability to switch between different devices, the new name instead reflects the "great pleasure or delight" that it hopes to add to the app. Right then... Adobe is also saying that it will soon be able to offer additional photography solutions on the newly named platform. Revel is a subscription-based service, with users expected to pay a monthly fee for the privilege of being able to access photos on their Mac, iPad and iPhone whenever they like. The new name change doesn't affect existing customers, and the app will be replaced when customers update to the latest version. Confusingly, although the name has changed, the word "carousel" will still be used within the app to reference a library of photos, so you'll still see buttons to create and delete "carousels" or photo libraries. Other good news is that while the Carousel Facebook and Twitter pages will be rebranded. if you're already following, you don't have to do anything... phew. Minor fixes to the app have also been made in the latest update, apparently responding to feedback received from users. Most notable are the ability to automatically import photos from the Camera Roll on an iPhone or iPad and the ability to share via Flickr.